The Frozen Sheets race will start at 13.00 on Monday 2nd January 2017. Prizegiving will be held in the main bar as soon as possible after the race finishes. Refreshments of Rum Punch and Mince Pies will be served in the Bosun’s Hut. Tickets for New Year’s Day Brunch are selling fast. This is a popular event with a limited number of tickets. We expect to sell out – buy now to avoid disappointment. Tickets available from the office or the bar. In keeping with the last few years we will be having a no-charge New Year’s Eve Party from 8.30pm onwards. Why not have dinner with family & friends and then head down to join everyone at TBYC to see in the New Year. The champagne is on ice and there will be dancing to DJ from 8.30pm onwards. TBYC New Year’s Day Brunch – the best way to start the New Year! Members of the General Committee, under the guidance of Mick Kilkelly & Martin Swindon, will be serving full English breakfast and other brunch options including scrambled eggs with Smoked Salmon (no pre-orders required). Tickets £8 per person (Children £5.00) go on sale Tuesday from the bar or the Office. We have two sittings for brunch – 11am or 12.30pm. You’ll need to select your sitting when you buy your tickets. You are welcome to arrive at any point during the session you have booked but you will need to vacate your table by 12:30pm for the first sitting or end of service at 2pm for the second sitting. This is always very popular and places are limited, so please buy your tickets early to avoid disappointment (ticket sales close 30th December or when we’ve sold out). Just a reminder that Leigh-on-Sea Sailing Club are running their Brass Monkey race this Sunday starting at 2:00pm. Due to the late notification and in the interests of fairness, the Sailing Committee have decided that no concessions (e.g. avg points) will be available to entrants. Links to the sailing instructions and entry form are available on an earlier posting. Thorpe Bays YC, Kyle Stoneham is currently enjoying the sun in Bermuda, whilst he races in the International Moth Regatta that is taking place. 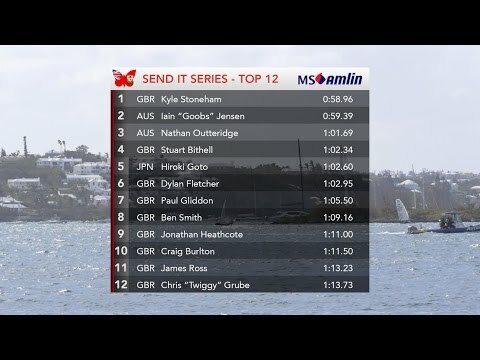 Even though racing was cancelled for a day due to strong winds, some of the competitors went sailing in Hamilton Harbour, so they decided to run some speed trials, with Kyle completing the one minute course in top slot. Well done Kyle. Don’t forget to buy your tickets from behind the bar for this Sunday’s Cadet Christmas Party. A bargain £5 includes party snacks, disco, games and a visit from Santa! Non-member friends/family of members attending the party are now welcome to come too! Please note that as we have to let Santa know how many children to expect, tickets WILL NOT be available to buy on the day – please purchase them by the end of Saturday. In order to prepare for the Yuletide Ball on Saturday evening the Main Bar will close at 1.45pm on Saturday. The Commodore Bar will be open from 1.45pm onwards.